Coupons are vouchers preloaded with specific values and discount credentials that enable customers to shop online with extra privileges. The above image shows how to create a coupon and add the details for a coupon. See the images below for a complete information on creating a coupon. Coupons hold the following information required for a successful process of purchase. Valid from and Valid upto - Set the coupon validation here. Choose the dates between which the coupon is valid. Product Categories - Choose the categories to which the coupon must applied. Products - Coupon usage applicable to the products added here. Brand or Manufacturer - Coupon usage applicable to the brands or manufacturer added here. Customer Groups - Coupon usage will be restricted to the user groups selected here. Minimum spending - minimum value required to avail the coupon privilege. Under the main Coupon's page in J2Store->Sales->Coupons.Click on the Checkbox under the field Enabled to enable/disable individual coupon. 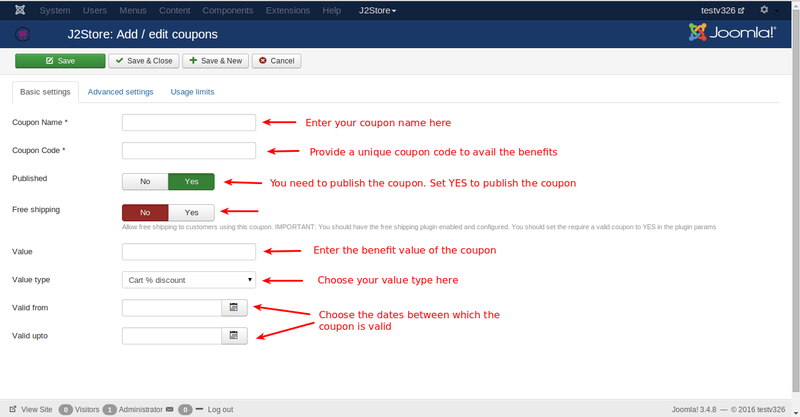 In the coupon's basic settings under J2Store->Sales->Coupons and choose the coupon which you want to enable or disable.